This is a challenge that you may HATE at the beginning, but grow to LOVE! In the spring of 2012, I was taking a biology class that was designed for non-science majors (because I originally went back to school for business). My professor, Dr. Fernandez-Nunez, seemed to be there on special assignment to convince non-science majors to become science majors. Well, I worked. He really flipped the switch on my nutrition education path. By that point, I had been running and watching my diet fairly closely for about 7 months. Weight loss had hit a plateau and I wondered if I would ever reach a normal BMI. Since that time, I have not only been able to blast pass the plateau, but have reached a healthy BMI, reduced fatigue, strengthened my immune system and I can attribute it to the 30 day no sugar challenge (that I loved so much I stuck with for over 6 months, and still work hard to limit added sugar)! While the video is lengthy, and some of the science may make your brain swim, the meat and bones is the fact that our human body was not meant to process the quantity of sugar nor chemical alternatives that we offer it on a daily basis. In areas of the world with low incidents of diabetes, cancer and heart disease, the people gain their nutrition from whole fruits, vegetables, lean protein and whole grains. Fruit is used as the sweetener, with the occasional addition of natural sweeteners such as honey. That is where the no sugar challenge comes in. There are several things that this "fast" does for us. It cleanses our system of additional sugar and toxic alternatives. During the time of the fast, there is a rejuvenation of the taste sensation that has becomes dull and desensitized to the sweetness in fruit and even in some vegetables. Somewhere around the second week, you may discover that foods have much more flavor and you will begin to enjoy good, whole foods. As you shop, you will want to become an avid label reader. It would be easy to assume certain foods, such as canned beans would not have sugar in them, but don't be fooled! I have seen kidney beans packed in high fructose corn syrup (a chemically modified form of sugar), pasta sauce with huge amounts of added sugar and high fructose corn syrup, standard peanut butter has loads of sugar, and you would be astonished to realized that pretty much any loaf of bread on the shelf has sugar, honey or high fructose corn syrup. 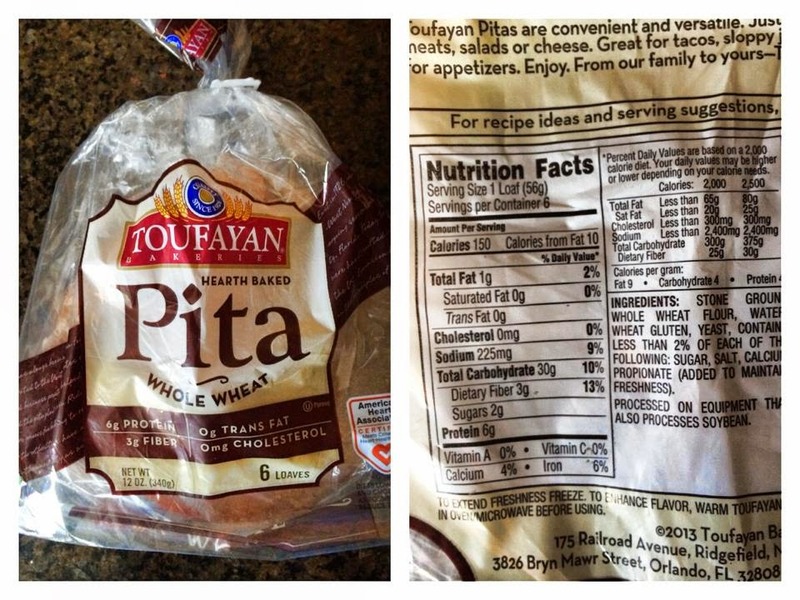 During the challenge (and even afterwards), I recommend these whole wheat pitas (or something similar). Carefully read the labels, folks! The ingredient list is your friend. Know what is in your food. This label indicates that there is less than 2% of a few ingredients, sugar being one of them. This is about as clean eating bread product as you can find. If you find something else, message me! As I mentioned before, pasta sauce, peanut butter, and condiments will most likely contain sugar. If you live in "Publix" land, their deli peanut butter is just plain ol' peanuts and it is FANTASTIC! As far as sauces are concerned, Hunts Garlic and Herb contains no sugar or high fructose corn syrup (but it is a little thin), and there are some other varieties that do not add sugar, but you need to read your label. 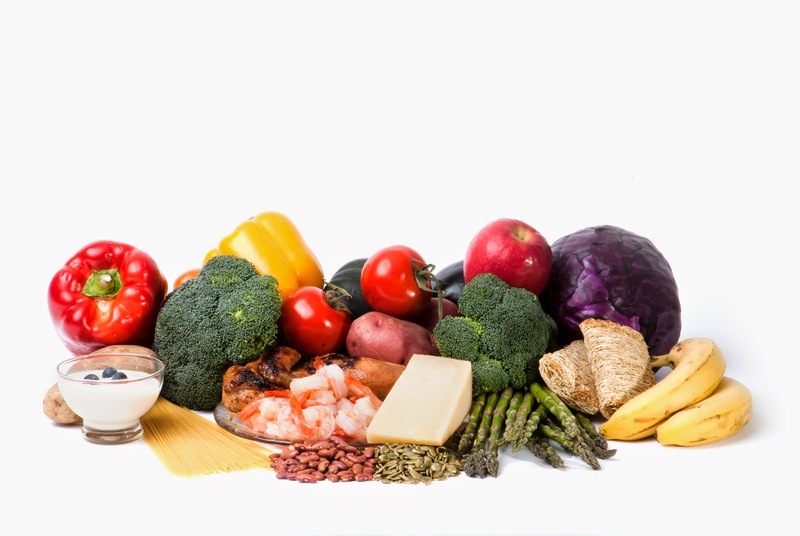 By and large, focus your meals around the veggies, lean protein, fruits and whole grains. Season with herbs, and dress your salads with different varieties of vinegar, mustards (check for sugar content), and some extra virgin olive oil. If you are weaning yourself from soda, consider seltzer water with orange, lemon or lime slices. Years ago, I was a diet Sprite lover, so when I was weaning myself off of artificial sweeteners, I began occasionally having this and it satisfied my desire for a fizzy drink. 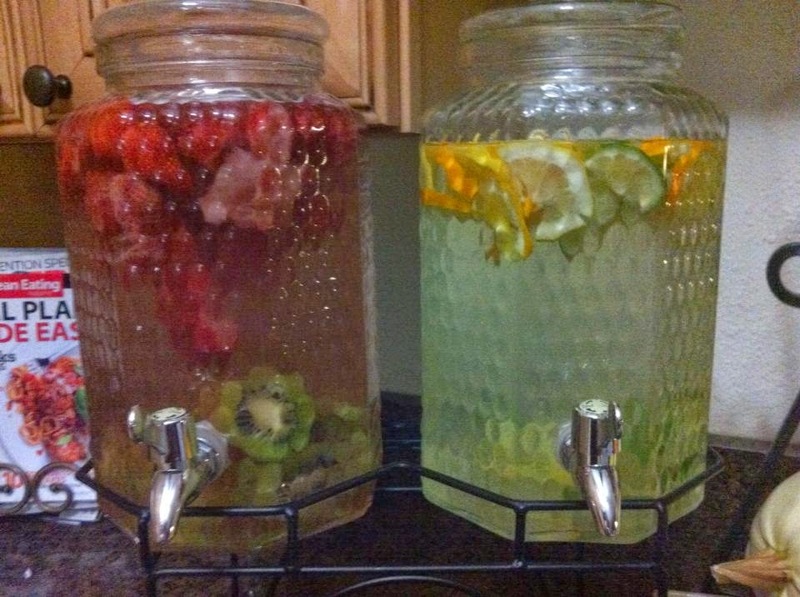 Another idea is to add fruit and mint to water. My absolute favorite is pineapple and mint. This is a great use for those pineapple cores that tend to just be thrown in the trash! During Thanksgiving time, I bought several bags of fresh cranberries and threw them in the freezer. Other combinations to try are strawberry and kiwi, lemon & lime, cucumber and melon. 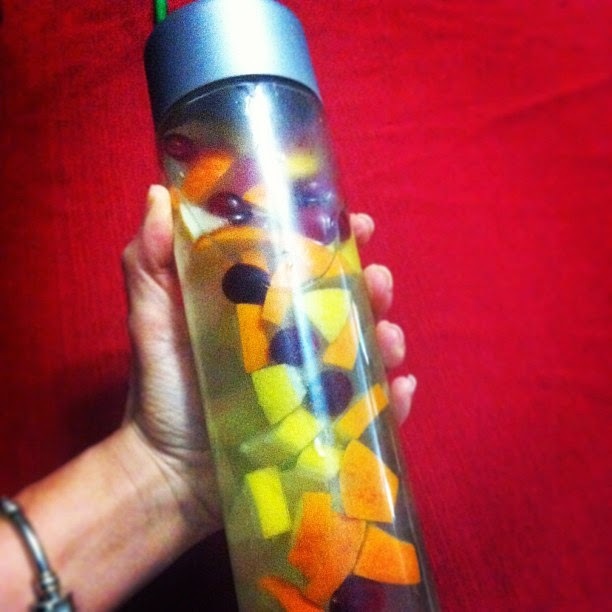 You will benefit from the added water, and from the increased vitamins from the fruit! Without a doubt, I love my coffee. Prior to my "no sugar awakening," I took my coffee with half & half and Splenda or some sort of flavored creamer. During the fast, I knew this would be the toughest spot for me. While I always wanted to be one of those "I'll take it black" gals, I just could not hack it. Here was my strategy: flavored coffee (coffee that has flavored grounds, such as hazelnut, French Vanilla, etc.) with a splash of half & half. The first few days were a bit rough, but honestly, by the second week it was just fine, and to this day, I can easily take my coffee with a small splash of half & half, and be happy about it :-). To make things more interesting, we were asked to prepare a recipe containing herbs two ways: one with fresh herbs and one with dried herbs. I found this recipe at the American Institute for Cancer Research. The original recipe calls to be served with grilled portobello mushrooms, but because my focus was on the herbs, I omitted them. In deep, heavy pot, combine oil and polenta. Cook over medium-high heat, stirring, until polenta smells toasty, about 2 minutes. Remove pot from heat. Add boiling water carefully to avoid spatters. Stir until polenta is smooth. 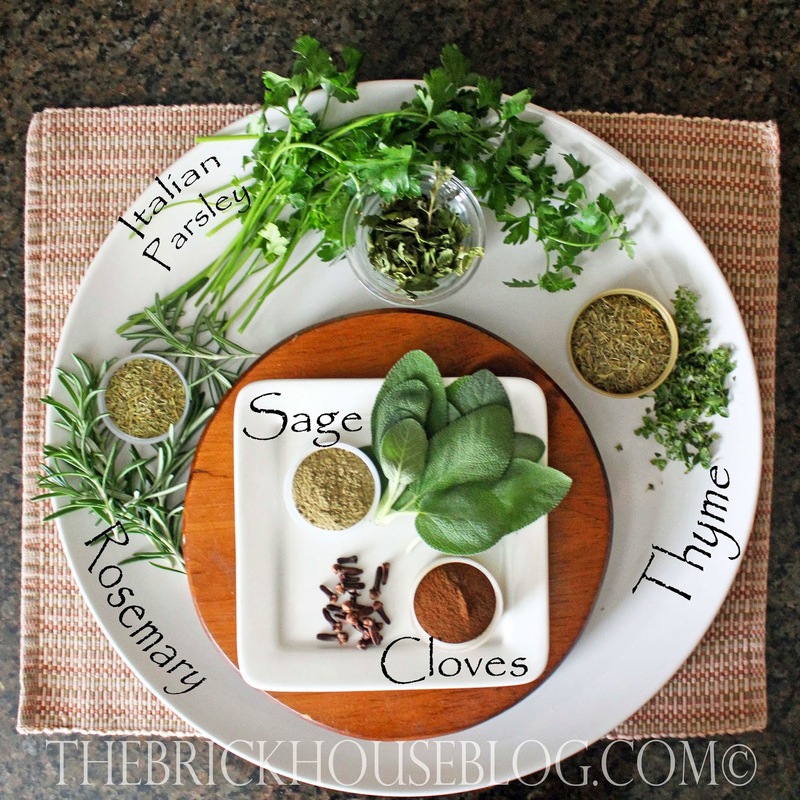 Mix in garlic, parsley, thyme, rosemary, salt and pepper. Bake polenta, uncovered 20 minutes. Stir well. Bake additional 20 minutes, or until polenta is creamy. Divide among 4 dinner plates. Sprinkle each with a quarter of the cheese. During the herb analysis, I determined that the flavor of the dried thyme leaves were very bitter and somewhat soapy tasting, but the fresh version was crisp and peppery. As I suspected, when the dishes were complete, the polenta with the dried herbs had a stronger, more bitter flavor than the polenta with the fresh herbs. The polenta with the fresh herbs smelled brighter, with high notes from the fresh herbs, while the polenta with the dried herbs had a more deep, earthy aroma. 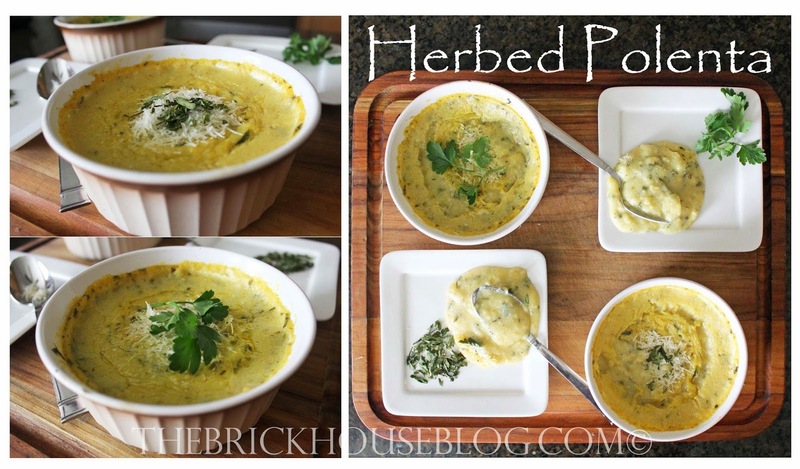 Visually, the polenta with the fresh herbs had more of a “garden fresh” look because of the brighter green herbs, which made it more appealing. 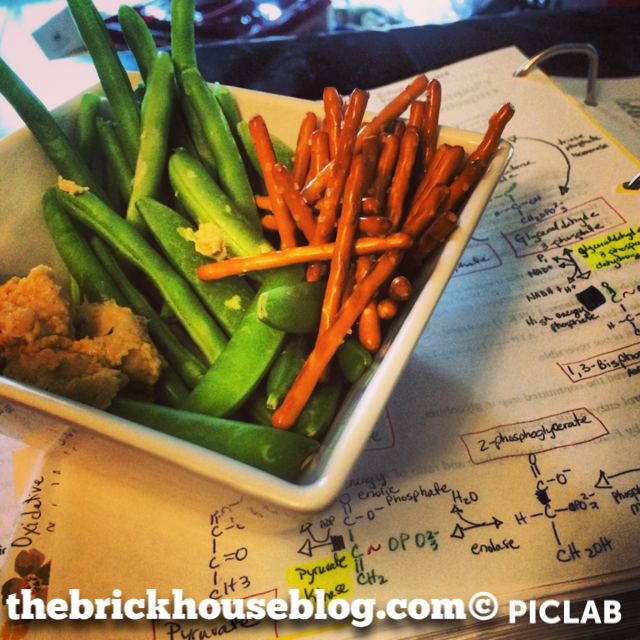 Over the years, The Brick House has been a place to share encouragement, tips, and how-tos, therefore, it only seems fitting to give a little info about my adventure into Dietetics that is only just beginning. As I was researching the field, I read many student blogs that were extremely insightful, so if you are considering a career in nutrition/dietetics, this may serve as a launch pad for you! Let me give you a little background. 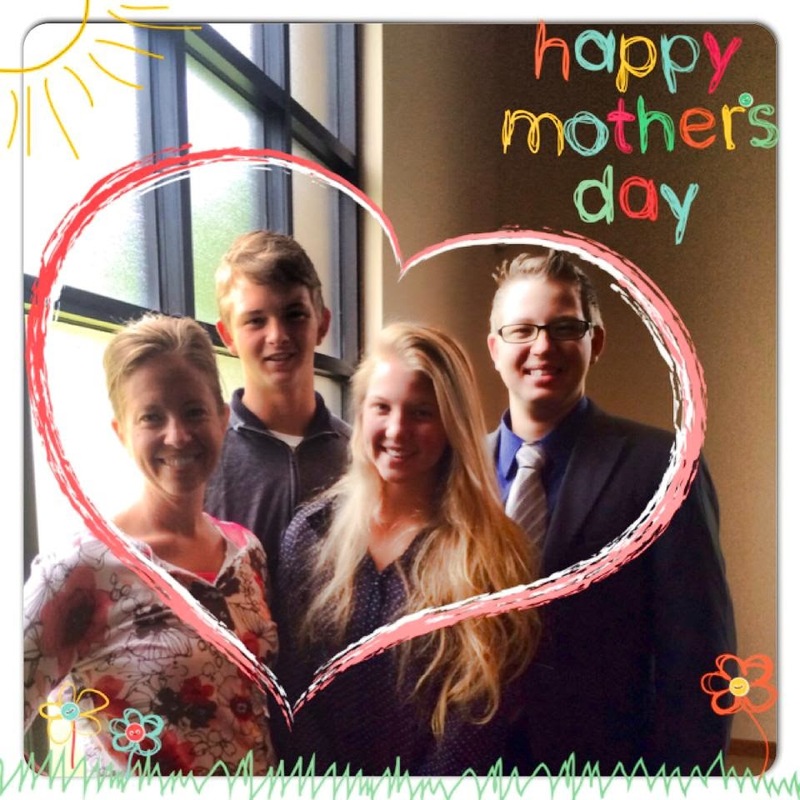 My husband and I married shortly after I graduated from high school with honors in business and within our first year of marriage, my oldest son was born. I entered college, initially interested in computers, but then switched my focus to business. After a year, we relocated to Central Florida and soon baby #2 and baby #3 came along. I knew early on that I would homeschool them, so my days were filled with teaching them how to learn (I’d rather not fill their bucket, but rather, teach them to learn… but that is another blog post altogether). After 10 years of marriage, my husband and I began an installation business that is now in its 10th year. In effort to assist him to the best of my ability, I took several classes through Daytona State Center for Business and Industry and Daytona State College Small Business Development Center. These resources were invaluable to the establishment of the business. A family based business offered several opportunities for our family. Aside from an income source, each of my children have been able to help their dad prepare for projects, learn a trade and be exposed to the entrepreneurial lifestyle (both good and bad). When the economy threatened to squeeze the life out of our business, I reenrolled in college. My oldest son began dual enrollment as a high school/homeschooler, my daughter was a freshman and my youngest was in 7th grade, all homeschooling through Florida Virtual School. This offered some flexibility for me to study, work part time all the while trying not to lose my mind! Initially, it seemed that the best thing for me to study was business management. During the second semester back, I took Biology (for non-science majors) with a professor who held a Bachelor’s in nutrition. He was assigned to teach this class in effort to convert non-science majors into science majors. It worked. While I always enjoyed reading about nutrition on a casual, need-to-know basis, I soon realized that I absolutely LOVED learning about the impact of nutrition on health. By this point I had begun cleaning up my diet and getting active, resulting in about 40+ lbs of weight loss. I quickly began researching the nutrition profession. Soon I discovered that the credentials for being able to work in the area of nutrition took dedication as well as commitment to a competitive education path. Quoting the Academy of Nutrition and Dietetics, “All registered dietitians are nutritionists, but not all nutritionists are registered dietitians. This is a distinction that can matter a great deal to people’s health.” The time investment of education would only be well spent in a program that would allow me to serve the public as a qualified professional. So I was on the hunt for an accredited program that would meet all of the needs of our family. The Academy’s website offers links to the accredited programs throughout the country and explains the different programs. One option is to enroll in a Didactic Program (Bachelor or Master’s) plus internship. The other option is a Coordinated program that allows students to complete the didactic studies and complete supervised practice hours within their Bachelor or Master’s program. There were several blogs that I read in which students who had completed the Didactic program were having an extremely difficult time being placed in an internship. Only about 50% of the applicants get placed. This seemed like a very scary position, because without the internship time, the students were unable to take the Registered Dietitian’s exam. I called into the Academy and discussed the options with an advisor, and based on where we live, there were no local programs of either kind available. 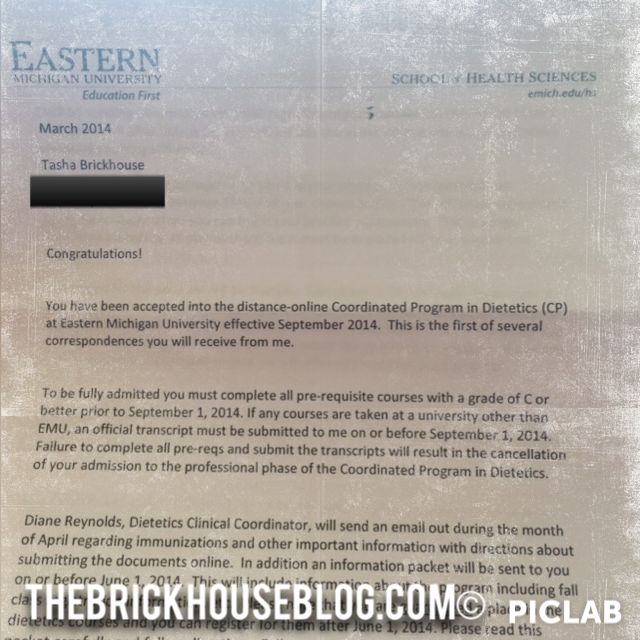 They suggested that I look for distance programs, and specifically recommended Eastern Michigan University Distance Coordinated Program in Dietetics. There were some huge advantages to this program. In a traditional internship program, the field time is already prearranged by the internship program director. This very unique program allows the student to make contact with potential preceptors and establish supervised work hour rotations. I will come back to this in a bit. So, with all of this information in hand, it seemed that I had a long road of science prerequisites to fulfill, and it seemed very daunting. So many of my classmates were already on a science tract, and I’m over here with a handful of business experience. Folks, my prayer life greatly increased as I worked my way through chemistry, organic chemistry, anatomy & physiology, microbiology and biochemistry. My friends heard me cry and whine all the way through. During the summer of 2013, I attended Florida Academy of Nutrition and Dietetics Annual Symposium. It was so enriching. The information sessions were dynamic and I felt right at home. During a meet and greet session, a dietitian from my county gave me the number of someone in our area who was developing a local dietitian’s chapter. That put the ball in play with regard to securing preceptors for the program. She will never know how valuable that 10 minute conversation was to me. In January of 2014, just 18 months after I set out to complete the prerequisites, I was sending in my application, which was a 3 ring binder full of requirements. At 37 years old, I was actually applying to my very first program of study, with a pocket full of life experience. The program has just 20 slots available each fall, and 82 students applied. I was slightly nervous, but God opened so many doors up to this point, that I had a peace in the fact that I only wanted to do what HE wanted me to do, and if this was it, I would earn a spot. To be entirely honest, I am supremely humbled that He has opened so many very specific opportunities for me. It has been the sort of journey that I literally felt as if He walked every step with me, grabbed ahold of each and every door that we encountered and held it opened as I walked through... My most important task? Well, of course, it was to be WILLING to walk through the door. That required getting out of my comfort zone, breaking out of the mental box that I had myself in, and believing that He can do all things in me when I am willing to calm myself into His presence. Mid-March, my son trotted in with the mail and I mindlessly begin opening the letters. I look down to read the details of the letter in my hand and see that I had been accepted into the program! There was a mighty shout in the house that day! So here I am, in May 2014, just a couple of months before I begin the program in late August, anxiously awaiting the experience of the next 2 years. While I feel like I have learned so much just in the preparation, I have not even begun yet. · I love that God has created us in such a magnificent way, and that He has created food sources for us to specifically meet EVERY SINGLE nutritional need that we have. 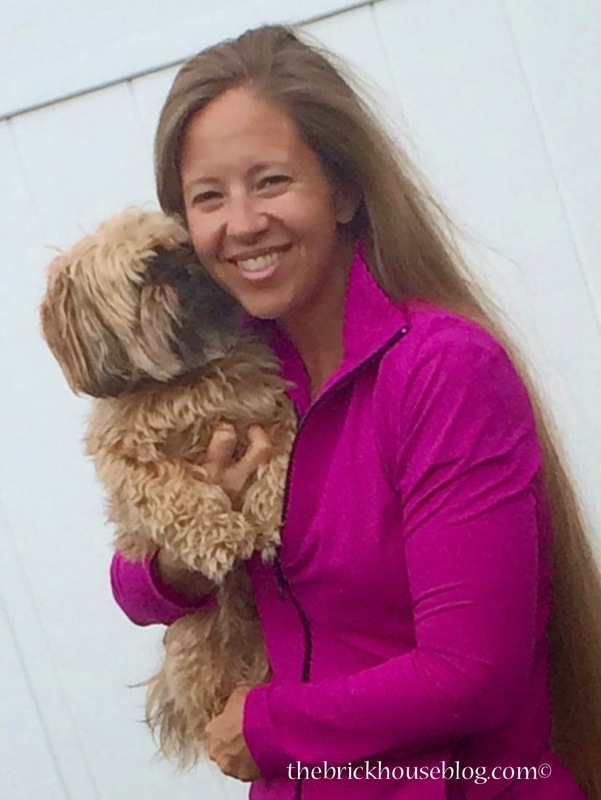 In closing, while I am not YET an expert in the area of nutrition, I hope to share some things along the way that may spark a desire for others to take ahold of the great benefits that come from placing a priority on eating well. I could barely wait to open the package on this new jacket from Kosher Casual! Their running skirt already made me a KC addict, but when Anna from Kosher Casual told me that they were coming out with a jacket, I was beyond excited! Living in Central Florida in April, the weather always keeps us guessing. Most days the sun is shining and the temperature is mild, somewhere around 70 degrees, but when the sun goes behind the clouds it can turn brisk quickly. Today I wore the jacket to my son's baseball game, and even in the sun it was the perfect item to wear. During the peak of the heat, it nicely wicked away any perspiration and when the clouds rolled in it kept the chill away. The material (90% polyester 10% lycra) is the softest, most flattering textile that I have come across in the last 3 years since I began running. It stays in place during movement and keeps its shape beautifully. This jacket is a great wash-and-wear item with plenty of color to dazzle your senses! This color is magenta, and they carry fuchsia, black, blue violet and cornflower blue. The sleeves are a comfortable length; on me, they lay slightly beyond the wrist, but not quite as long as thumb hole shirts. This is a perfect length for those chilly mornings when you don't want to running gloves, but you want to cover your hands. The jacket has a full zipper, neatly enclosed in the in the structure of the interior facing of the jacket that travels up to cover the neck. Unzipped, the collar sits nicely on its own to offer a sporty style. There are zippered pockets on either side of the waist. With a flattering ladies cut design, the body of the jacket offers a smooth feminine style. This has become my favorite athletic jacket! For those of you that enjoy modesty in your active lifestyle, Kosher Casual has many things to offer! Check out the running skirts while you are on their website. The quality is superb! 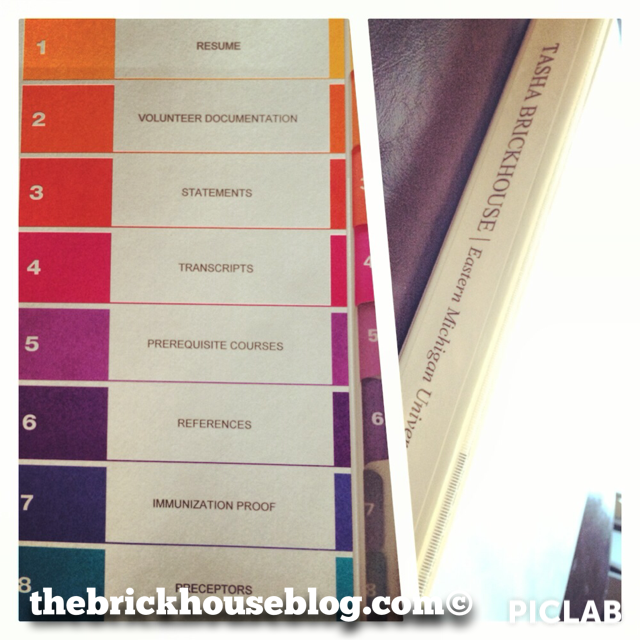 *This post contains affiliate links to products that I love and recommend which help support The Brick House.